General Motors’ Motorama car shows of the 1950s were widely documented and are well-known for their opulence and extravagance. Show cars from Motorama were designed to capture the hearts and minds of those that attended the touring car show as it visited different American cities and were representative of the strength of Detroit’s automotive industry at the time. MotorCities recently documented one of our personal favorite Motorama concepts, bringing it back into memory for us: the 1955 GMC L’Universelle Dream Truck. This concept was built for the 1955 Motorama and was intended to be a forward-thinking take on the relatively basic panel van. In addition to the retro-futuristic space-age design, the GMC L’Universelle also had its engine mounted mid-ship, along with front-wheel drive. Without a driveshaft running the length of the van, the Dream Truck was able to accommodate a lower floor, allowing for more cargo and passenger space and enabling easier rear loading. 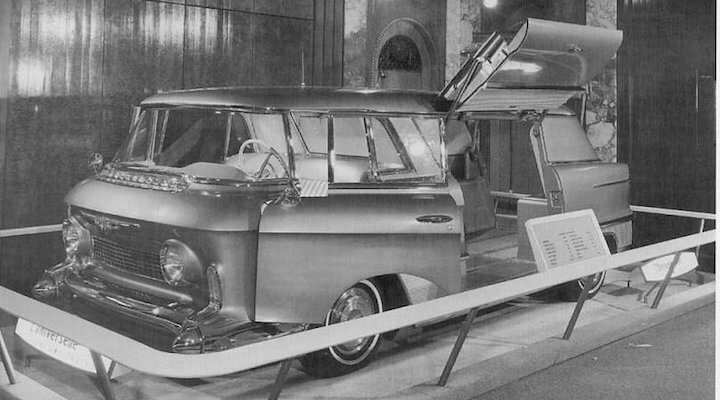 The cab-forward driving position and the widescreen windshield also provided superior visibility to other vans of the time. Speaking of the engine, it was a Pontiac-sourced 4.6-liter V8, which was paired with a front transaxle. Because the driver’s was well ahead of the front wheels, a rather confusing series of steering shafts directed back to the front wheels to enable steering. Other unique aspects of the GMC L’Universelle included upward-opening gullwing doors, which were designed to provide easier ingress for passengers in tight parking spaces – similar to the Tesla Model X’s ‘Falcon Wing’ doors. With radical ideas like a front transxle and gullwing doors, you wouldn’t be blamed for thinking that GM never intended to put the GMC L’Universelle into production. The executives behind the project fully intended to build the van, however, and were allegedly quite disappointed when it was deemed too complicated/expensive for production. In a way, the GMC L’Universelle is similar to many modern-day electric cars – maximizing its interior space via a flat floor to deliver added practicality and a panoramic outward view. What do you think, GMC, is it time to have another crack at a vehicle like the L’Universelle, but this time with an electric powertrain? 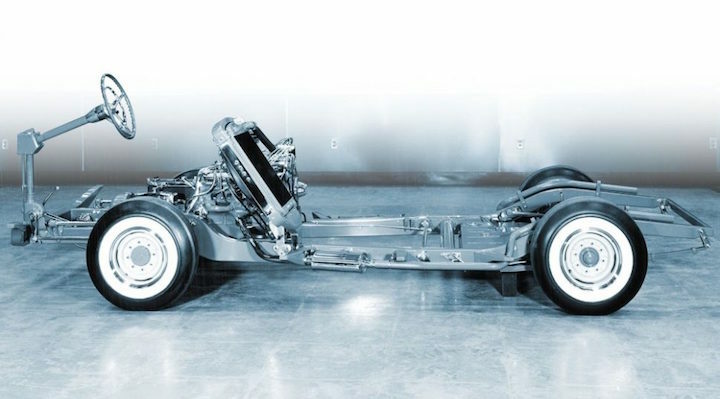 Next story Is This GMC Terrain Prototype Hiding An Electric Powertrain? Actually some of the thinking here was modified and used in the Corvair van and truck. The air cooled trans axle engine was just moved to the rear. They used a ramp side on the truck. The van door is not durable yet today on the Tesla and less so in the 60’s. While this was not a full production vehicle it did serve as ideas for some things that did mak3 production. Nowadays, they should show an electric GMC’s van, called ” L’Universelle”, why not? Best concept ever? Come on, GMA, give us a break!